There were more...but we couldn't stop eating them out of hand. DH and i picked berries together and it was such fun. 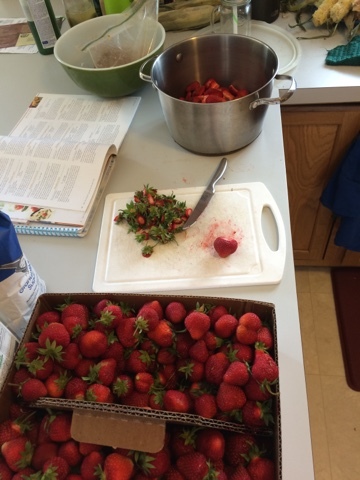 (in June...)Ive never been strawberry picking, only peach picking(In August before school started again). My Mom and I used to go picking peaches together. There aren't any good peaches up in Minnesota. They advertise them, but the ones I've bought have just been flat in my mouth. No zing the way a peach should have. That sweetness that drips down your chin and pulls your mouth into a smile as you eat it. Nope, they just don't exist here. Only in South Carolina. I know that you think Georgia produces more peaches than anywhere, but they don't. South Carolina produces more peaches, Georgia just advertises more. I digress, strawberries. So living in a different location brings different fruits and vegetables to the dining room table. I may not be able to get sweet, fresh peaches here in Minnesota. 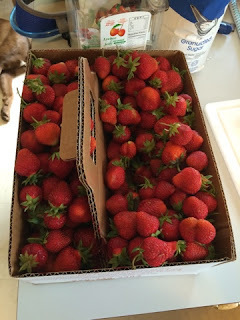 But, the strawberries are out of this world! I've never tasted a strawberry picked right off the bush and still warm from the sun. It's a slice of heaven. I wanted to save that strawberry heaven feeling, so I decided to make... strawberry jam. And of course, no complaints from DH as it's his favorite flavor of jam! 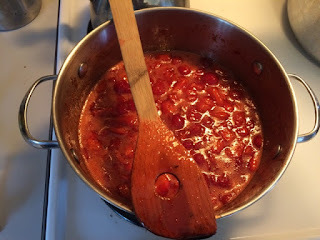 I also made some apple jelly. You can see the finished apple jelly on the left and the strawberry jam on the right. And the peanut butter that I had to buy so we could have PB&Js with all the yummy jam! 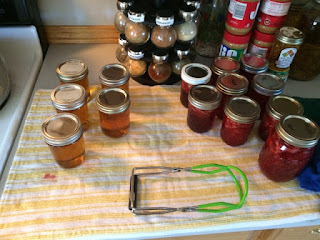 I took this recipe from my favorite canning book. I'm sure you would love it. The Better homes and garden canning book. I've made almost every recipe in it and it is wonderful! Another thing to add to my pantry/cellar that's going to be in the basement. I can't wait for that jam to set so I can have a sandwich and a cuppa tea. All in all I used about half of the box of strawberries to make 8 half pints and 1 pint plus a little bit that I didn't fill up a whole jar so it's in the fridge. Not bad for a few hours of work I'd say! How much meat do I need for a year?